What makes ID one Skis so special? Heart. Spirit. Integrity. ID one Ski has one philosophy and one standard. That is to simply make the highest quality, best performing ski for the competitive mogul skier. Each ski is designed and constructed to accommodate the demanding requirements that come from a variety of styles, heights, weight and strength of these special skiers. We know there are a lot of good skis you can choose to compete on. We simply want to make the best ski for you. We want to be the one. We want to be your one. Why do ID one Skis seem to cost more than others? You’ve heard the old saying.... “You get what you pay for". We believe that could not be truer here. The materials, quality, value, and craftsmanship are unlike any other ski produced today. From the specialized graphite base material, the stainless steel edges, the hand selected wood core, and the timeless Japanese Craftsmanship - no other ski is like this. You will feel the difference in your very first run. You can count on these exacting standards in every pair of ID one Skis produced. ID one Ski never set out to be the biggest, simply to make the best ski for you. You’ll find so many of the world's very best mogul skiers competing on ID one Skis. Are the ID one Skis I buy today the same skis produced for World Cup Athletes? Absolutely! At ID one, there is only one standard of excellence, one standard for quality. The world’s top elite mogul skiers use the exact same skis we offer to you, right here at ID one USA. What are the lead times to receive my ID one Skis? ID one makes skis only 2 times per year. During this time each and every ski is meticulously handcrafted to exacting specifications and always in limited quantities. Because of these limited product cycles, should we exhaust our current inventory here in the U.S., we may be forced to wait until the next production cycle to replenish our stock. If this were the case, some orders can take up to 6 months to fulfill. We're dedicated to keeping inventory in stock in the US. If you’re interested in skiing on ID one Skis in the upcoming season or in your summer training, we encourage you to make your decision earlier than later and place your order. At ID one USA, we promise to always keep you informed of when you can expect to receive your ID one Skis. Why has it been so hard to get ID one Skis in the US? Because of the limited quantities produced, US customers have had a difficult time finding ID one Skis. Only under a special arrangement with Material Sports, Inc. of Japan, and the new affiliation with ID one USA, has the company agreed to expand its production for greater availability in the US market. We are honored that they chose us to represent them. Do you offer “Pro-Form Pricing” for athletes, clubs or group purchases? The pricing for Mogul Skis on our site IS our Pro-Form Pricing. Everyone who buys our skis already falls into one of these categories. We have priced our skis as competitively as we possibly can. We have the same pro-form pricing for all skiers. We understand and appreciate the resources it takes to compete in moguls. We also appreciate the additional commitment it takes to ski on ID ones. We feel strongly in the value and performance you’ll receive should you make the choice and find your one. What are “Seamless Edge” and a “Cracked Edge”? All of our skis have a Stainless Steel Edge. Our MR-J, MR-D, MR-G, and MR-CE all have a Cracked Edge. Our MR-SG and MR-G1 have a Seamless Edge. This is how we control the flex throughout the entire ski. A Cracked Edge has microscopic “cracks” on the edges to deliver the flexibility and performance you’re looking for in these models. The Seamless Edge in the MR-SG and MR-G1 have no cracks. It is seamless stainless steel. This increases the stiffness required when your strength and ability demand it. Any other unique features I should know about? The Base of our skis are a highly engineered, specialized graphite material. You get a perfectly flat base and a micro precision finish. They are tough, fast, and durable. Our Technical Advisors will tell you to put a coat of wax on them at least once a season, but it is not required. Waxing is your choice. Our skis are ready to compete the day you receive them. You’ll notice the difference the first time you see them and put them to the test. Okay…. So how do I choose the pair that’s right for me? Simple. ID one USA has brought you a lineup that should fit every Mogul Skier’s requirements. Start your process by selecting the ski that matches your height. In most cases, this is all you need to do, especially if you fall in a 140cm to a 168cm. If your ski size falls in-between a 172cm and a 182cm, then your additional choice is whether you want a Cracked Edge or a Seamless Edge. 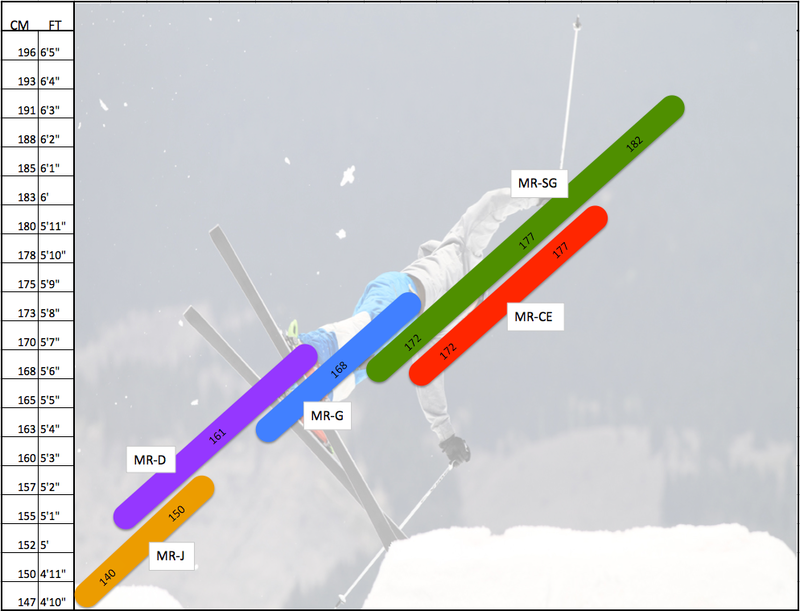 If you are a bigger, stronger skier then the MR-SG in 172cm, 177cm or 182cm may be right for you. If you are a lighter smaller skier, then the MR-CE 172cm or the MR-CE 177cm would be your choice.